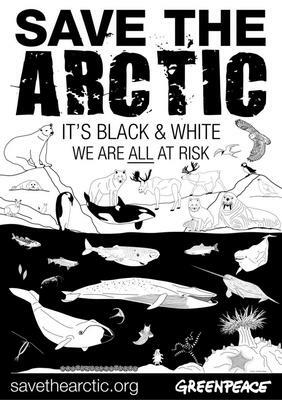 I am a Montreal native, and I recently created a poster to help spread awareness to save the Arctic. Climate change is to blame for a significant portion of the glacial ice melting due to global warming, and this, in turn, is allowing destructive fishing vessels to move further north into pristine territory where many animals call home. It took me about 40 hours of research and execution to create this poster using Illustrator software. However, I took a different approach than most entries, whereas I wanted to showcase all animals at risk in this unique ecosystem, from the very massive to the microscopic in size. However, there are many more species at risk, including some yet undiscovered. Climate change does not only affect these animals, it also affects us, humans, on a global scale. As a result, our planet is seeing more droughts, wildfires and dust storms, as well as more floods, tropical storms and hurricanes. This overall rise in temperature is causing lake levels to shrink and glaciers and polar ice caps to melt, which in turn is causing sea levels to rise and acidifying our oceans. We risk losing species to habitat destruction and extinction. We can take a stand and make a difference.